Dear Old Duke will be a multi-part photo essay series made up of photographs from decades past pulled from The Chronicle's files and re-created with faculty members and administrators still at the University. What's changed in their lives and at Duke since the original photos, told in their own words, will accompany each picture. Through their stories and images, we'll take a glimpse at the history of the University and the people who have long been a part of it. An archaeologist couple who came to Duke in the 1970s made waves for their excavations of ancient synagogues. Carol, Mary Grace Wilson professor of religion, and Eric Meyers, Bernice and Morton Lerner emeritus professor in Judaic studies, retired together from the University in 2015 so they would have time to do things together, which included teaching in Rome last year. 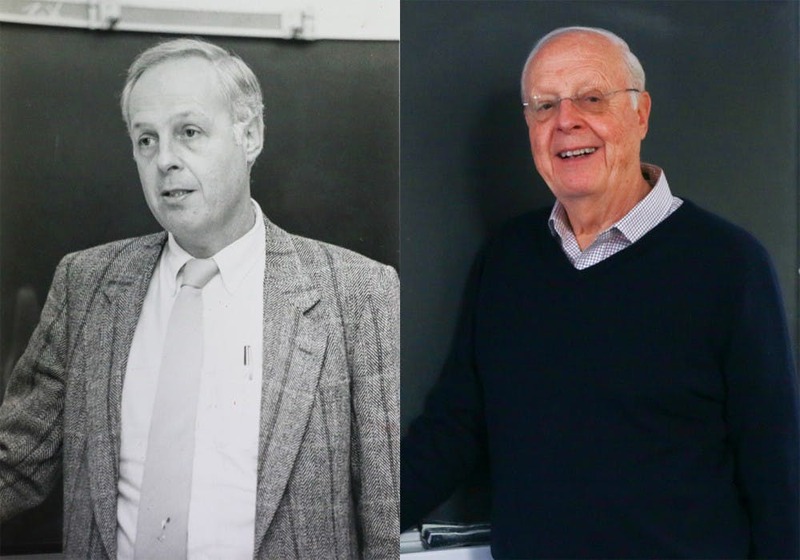 They both maintain offices in the religious studies department and have been involved with Duke for almost 50 years. In 1981, they were featured in People Magazine for their work excavating the ancient Ark of the Synagogue. They were the first married couple to be tenured in the humanities and the first to hold distinguished chairs in the same department. Eric Meyers: "'Finders of the Lost Ark'—they did not understand it was the ark that held the biblical scrolls of the ancient synagogue, so the headlines all over the country read that 'archaeologists find ancient Ark of the Covenant in the Desert of Galilee,' which is one of the most heavily forested places in the world." Carol Meyers: "1981 was the summer the first 'Raiders [of the Lost Ark]' film was released...So we didn't know about that. We get back from the excavations, we send our kids off to summer camp and we were about to fly to New York for a vacation on Shelter Island. We did what we always did, we prepared a typewritten report that we handed to the...Office of Public Relations. We said, 'Here's what we did, and tomorrow we are going to New York.' [The head of the office] said 'You should go to the movies tonight.' I said no, we've got all this laundry to do." EM: "This is on a Saturday afternoon, he calls! And we're scheduled to go at 7 a.m. on Sunday morning." CM: "I said 'Listen, we just got back. We've been gone for two months and I haven't done any laundry yet.'" EM: "And we were exhausted." CM: "So we went, and we saw 'Raiders of the Lost Ark.'" EM: "But after we saw it, we said 'Oh my God, now I get it. Everyone's going to confuse the Ark of the Covenant with the Ark of the Synagogue.'" CM: "So we get to our friend's house [in New York], and no sooner do we get there than the phone starts ringing...We went on Good Morning America. We had to go shopping because we had bathing suits and blue jeans. We had no, you know, [clothes for] television... Among the many reporters that called was People Magazine." But one of the great things is that Duke has become more diverse. When we started teaching, students were very white, not diverse at all in race, religion, sexual orientation." EM: "More international students, especially at the graduate level." CM: "I mean, these are wonderful transformations in my opinion." Eric Meyers: "The main thing that would concern us as teachers and researchers would be the decline in interest in the humanities, in favor of STEM subjects and professional placement. This is not a Duke-only problem, it's a national and international trend... So, that's lamentable in general. And the sports campus—Wilson Gym and the football stadium—those upgrades have been huge and physically transformative, but we still can't fill the football stadium. We can't even fill Cameron, bleacher seats are being sold to grownups each week." CM: "We've been season ticket holders since the early 1970s."